White spot disease is caused by a parasite called Ichthyophthirius multifilis. This disease is also called Ick or occasionally Ich or Ichy. The fish has white spots on its skin. The spots are about the size of a pinhead and the fish can look as if it has been sprinkled with salt or sugar grains. The parasite also attacks the gills of fish. This is more difficult to see. The gills may look more red than usual, but this is hard to see, and excessively red gills can be caused by a number of things. The gill infection makes it more difficult for the fish to absorb Oxygen from the water and infected fish can show signs of being short of Oxygen like "gasping" at the surface, or apparently breathing very fast. This shortage of Oxygen can be caused by many things. Sometimes fish will swim down and try to rub their skin against objects. This is called "flashing" and can be caused by any skin irritation. Sometimes fish show no obvious symptoms, but simply die. If a fish dies you should take a very close look at all the fish in the tank. This is a very common disease of fish. The parasite is present at low levels in most aquariums, often without causing any trouble. Most fish have been exposed to this parasite and have developed some immunity. Those fish that have been raised in the complete absence of the parasite will not have this acquired immunity and will be very vulnerable to infection. The statement that this parasite is present in most aquariums is often misunderstood. Ichthyophthirius multifilis cannot lie dormant for long periods. It survives by living on fish. An aquarium might be empty of fish for a month. It would be free of the white spot parasite. Then a fish was bought which was free of any visible disease and then quarantined. This fish could be introduced into the empty tank and develop white spot. The erroneous conclusion might be drawn that either the empty tank had a dormant white spot, or that the quarantine was not correctly done. What would actually have happened would simply be that the fish had a white spot infection without any symptoms. A successful parasite does not make its host ill. If the parasite wiped out all the fish in the aquarium, pond or lake it was in, the parasite itself would also die. In the wild, the white spot parasite is apparently successful and most of the time does not kill its host. In the unnatural ecosystem of an aquarium, it can easily get out of balance and kill all the fish. This is not only fatal to the fish; it is also fatal to the parasite. The ideal parasite is one that actually gives some advantage to its host. As far as I am aware, having the white spot parasite is no advantage to fish, but other parasite/host relationships may have developed into symbiotic ones where both organisms get an advantage. If something stresses the fish, their immune system often becomes less effective. The same effect can be observed in people. You are much more likely to get both minor and major diseases when you are under stress. There are many things that can stress fish. One very common one is simply being caught, put into a plastic bag and transported to a new home. A common time for an outbreak of White Spot is just after a new fish has been added. Some people incorrectly assume that the new fish has introduced the parasite. They may then go back to the shop they bought it from and see that the tank the fish came from is perfectly all right. Other types of stress include changes in temperature, pH, dH or any other water parameter. Ichthyophthirius Multifilisis an obligate parasite. This means that it can only live in the presence of fish. The actual visible white spots are the feeding stage, called a trophont. 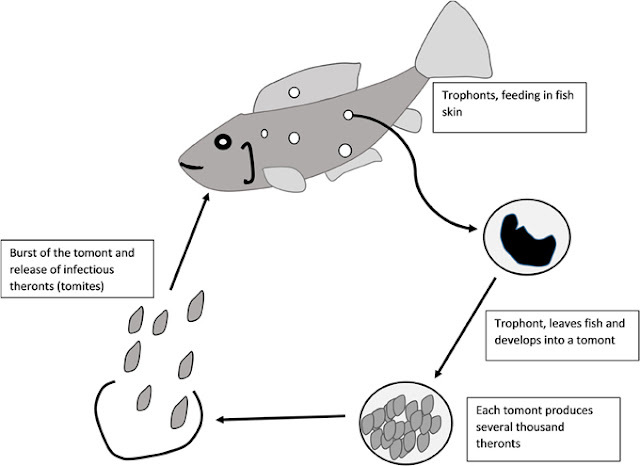 The trophont grows and then drops off the fish, falling to the bottom of the tank and forms a cyst called a tomont. Inside the tomont, as many as 1000 tomites can form. The tomont opens and the tomites go into the water. The time it takes for Ichthyophthirius Multifilis to complete its life cycle depends on the temperature of the water. At 6 degrees C (43 degrees F) is gets through its life cycle in about 55 days, while at 29 degrees C (84 degrees F) it completes its cycle in only about 4 days. The tomites have to find a fish quickly or they will die. At normal tropical fish tank temperatures, they only have about 2 days to find a fish to infect. The trophont on the fish probably cannot be successfully treated, although claims have been made of successful treatments with salt baths. The tomonts on the bottom of the tank are also hard to kill although they can be removed by gravel washing. Keeping the tank clean will help. The only stage that is readily susceptible to treatment is the free swimming tomite. This can be killed by many things including heat, ultraviolet light, salt and many other chemicals. There are many commercial treatments for white spot. They generally use some combination of chemicals like Methylene Blue, Malachite Green, Formaldehyde, Acriflavine etc. In our own tanks, the medication I prefer is Wardley Ickaway, but different people will have their own preferences. Note that these medications are absorbed by activated carbon and if you have carbon filtration it will need to be turned off. Most of the medications are also destroyed by ultraviolet light, so ultraviolet sterilization will also need to be turned off. Tetras and other Characins, scaleless fish like loaches and catfish as well as baby fish are more susceptible to many of these medications, and they will need to be used a half the normal rate. You can use the half rate at double the normal frequency. The life cycle of this parasite is speeded up enormously by heat. Increasing the temperature will make the chemical treatments work faster, but will also mean that the infection will spread faster. However, if the temperature is raised enough the parasite cannot reproduce and the infection can be cured just with heat. But some types of fish cannot survive the temperature needed to destroy white spot. To break the life cycle of this parasite you need to raise the temperature to about 30 degrees C (86 degrees F). To actually kill the parasite you need to raise the temperature to about 32 degrees C (89.6 degrees F). This temperature would need to be maintained for at least four days to have much chance of killing the parasite. Not all fish can survive this treatment and many that can be badly stressed by it. Increased aeration will be needed because Oxygen does not dissolve as much in warm water, and the fish's metabolism increases as the water warm up to the need more Oxygen. This method of treatment is sometimes the method of choice if you are treating Labyrinth fish like Siamese Fighting Fish, Gouramis or Paradise Fish. These fish can survive the temperatures needed and can breathe air as well as water. Some people have reported success in treating this disease by the careful use of chlorinated tap water. Personally, I would not attempt this, and I advise other people not to try. The actual level of Chlorine in the water as it comes from the tap varies, not just with the locality, but also with the day of the week and the season of the year. Apart from the difficulty of getting the dose of Chlorine right, there is the problem that some places, like the Adelaide Hills where I live, have Chloranimated water. This is deadly to fish and I would not risk using the water at all without dechloranimating it. Salt will kill the white spot parasite, but different strains have different tolerances. Most strains of the white spot will be killed by 3 grams per liter of salt, but to be sure you will need to use 5 grams per liter. This means that many common aquarium fish cannot survive the level of salt needed to kill white spot. Generally, this treatment method is unsuitable for fish from places without much salt in the water like the rivers Amazon, Congo, and Orinoco. It can be used on the livebearers like Guppies, Mollies, Platies, and Swordtails. It can also be used with some of the Australian fish like the Murray Cod, Silver Perch, and Callop, but not safely on the Rainbowfish. Most aquarium plants will be killed by this level of salt. Ultraviolet light will kill the free swimming tomite stage of the parasite, but can only work on the tomites actually sucked through the ultraviolet sterilizer. You are more likely to get good results if the ultraviolet unit is more powerful than usually recommended for your sized aquarium. An ultraviolet filter will help to prevent white spot, but cannot be relied on to cure it. It is possible to breed fish in the complete absence of the white spot parasite. This happens with many of the livebearers bred in Malaysia. These fish are grown in water which is a mixture of freshwater and seawater, sometimes having as much as half the salt concentration of pure sea water. 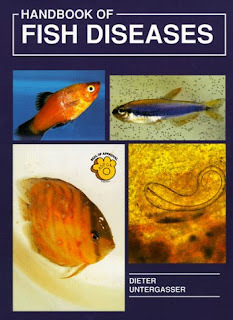 These fish will never have been exposed to white spot and to some other diseases and will be very susceptible to them. These fish can be wiped out quickly. If they are bought they need to be observed and treatment applied quickly as needed. Aquarium shops will normally warn their customers that the fish are disease-free. White spot infection damages the skin of the fish and it is common for bacterial or fungal infections to occur together with the white spot. Some types of fish get the white spot disease more easily than others. The Clown Loach has a particularly bad reputation for getting this disease. Steve Challis has many fish fact sheets and other fish articles at bettatrading.com.au, and Wild Life and Astronomy articles at stevechallis.net. To see pictures of fish infected with White Spot, see http://www.bettatrading.com.au/White-Spot.php. One of the most common diseases encountered by tropical fish hobbyists, is the common parasite known as "ick" or "ich", for ichthyophthirius. In most cases, white spots on a fish's scales are the first sign noticed, although it's possible fish may begin rubbing themselves against objects as well, since it's a very irritating condition. In severe cases, the fish may even have a gray slimy appearance to their body. By the time obvious symptoms develop, your tank would be well-infested. In the initial stage, the parasite will burrow under the fish's scales and skin, where it lingers, feeding off the skin cells and blood of its host until it's fully developed. The Ich then breaks through the skin of the fish and falls off into the water, landing on the substrate where it forms a cyst, and begins to multiply, producing up to 1,000 new parasites. The entire life cycle can take as little as 4-6 days. Because the most vulnerable stage is when they are free swimming, it will be necessary to treat the entire tank, because once a parasite has started to replicate, the tank is already contaminated. You can however, remove severely infected fish to a hospital tank for some extra, topical treatments to try and help it recover, and to prevent secondary infections. The home tank should be treated by raising the temperature four degrees, and adding a small amount of aquarium salt. Any inhabitants that can't tolerate the salt, should be moved to their own, separate tank until the original one is free of parasites. Medications for adding to the water are available at your fish supply store. Remember that because of their life cycle, and needing to treat the free swimming stage, you will need to medicate the tank every few days, and the entire course of treatment can take up to three weeks.